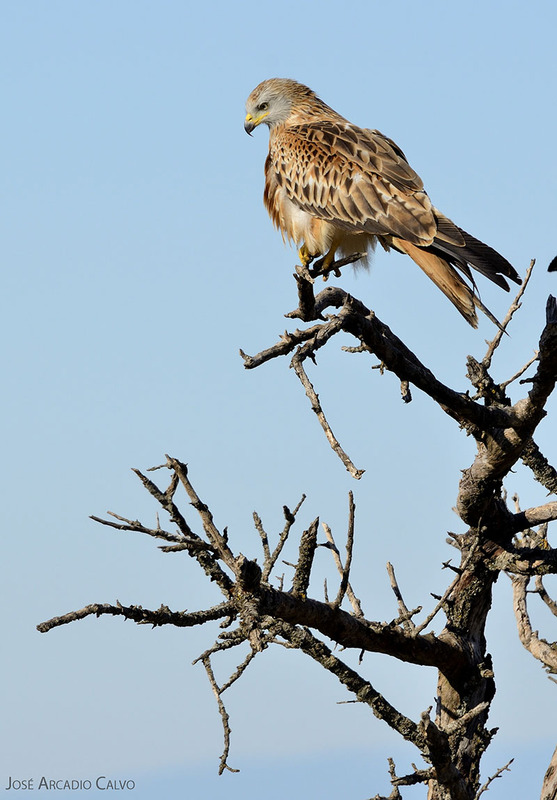 Average sized bird of prey (61-66cm), with an elegant figure, a wingspan which surpasses 1.75m, and a characteristic forked tail. It has a high pitched call, heard during courtship, nesting grounds, sleeping areas and feeding grounds. It’s predominantly of a reddish colour, although with a large array of contrasts and tones, a grey head and whitish primary feathers in the distal part of the wings. Habitat: They are gliders, with a great ability for aerial surveillance, frequenting open areas, pastures and crops, where they search for food, and close by forested areas where they nest; they also frequent grasslands in the plains or foothills of the sierras with livestock. The species is very closely associated to human activities and they are seen close to farms, towns, roads, dunghills and rubbish dumps where they obtain food. Nutrition: Opportunistic species with a very variable diet. They capture medium sized prey, from insects to small mammals and birds. Rabbits are of upmost importance in the Mediterranean populations. Carrion makes up a large percentage of their diet. Daily trophic needs: Estimated at 200 g/day for an adult specimen. Reproduction: It builds its nests in trees, generally of large dimensions, and depending on the region they prefer poplars, pines and oaks. The resident population quickly occupy the nesting spots. They lay the eggs in April, and incubation lasts between 28-30 days. The chicks tend to stay at the nest for around 40 to 50 days. Once they leave the nest they are still dependant on their parents for another two to three weeks. Species with two recognized subspecies, one of them, M. m fasciicauda, is possibly extinct. The global distribution of the subspecies M. m. milvus is restricted to the western Paleartic, and also in a very localized area of northern Africa (Morocco). 90% of the global population is concentrated in Europe, especially in Germany, France and Spain. In our country they are spread out in three large areas: the peninsular northeast, the western centre of the Peninsula, and the Central System. Although it is found in all of the provinces of Castile & Leon, the largest populations are located in the pen plains of Salamanca and Zamora, and at the foothills and northern slopes of the Central System mainly in Segovia and Avila. This species has been suffering a pronounced and continuous decrease in numbers over the last few decades. In 2009 the global population of breeding pairs was estimated at 21.000-25.500, with the largest populations and areas of distribution found in Europe. In Spain, just over 2.000 pairs were censuses in 2004, only half of the number of 10 years earlier. The decrease in the reproductive population in the last years continues. In Castile & Leon in 1994 the reproductive population was around 1.800 pairs, in 2004 it descended to 1.100 pairs and the last census in 2008 showed a population of just 877 pairs. Castile & Leon are home to approximately half of the Spanish population. 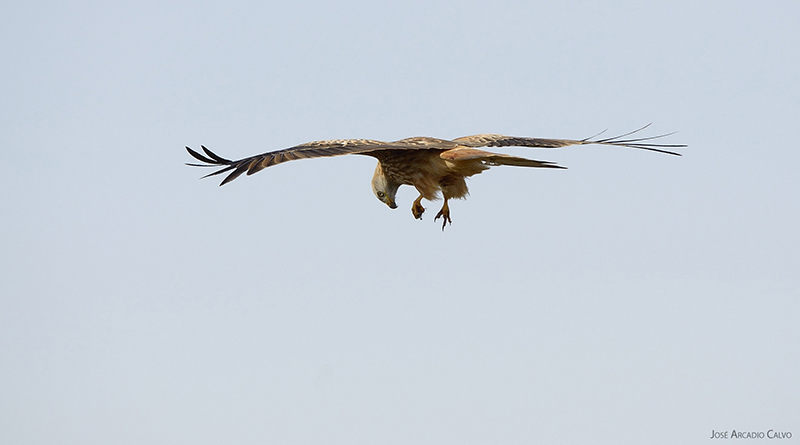 Numerous causes affect the red kite populations negatively. Their opportunistic and scavenger feeding strategy makes them very vulnerable to poisoned lures, and intoxication from rodenticides and other substances used for pest control. Due to the fact that they frequent human areas (farms, rubbish dumps, etc.) electrocution is a real risk too. Finally, the current management of farms and slaughterhouses, as well as the disappearance of dunghills, have reduced drastically the amount of available food for both the winter and reproductive populations.